Outside the walls of the Kremlin are the Alexander Gardens, built by Tsar Alexander following the defeat of Napoleon. The tomb of the unknown soldier is at the entrance to the gardens & 10 of these red porphyry blocks with the names of WWII Hero cities. 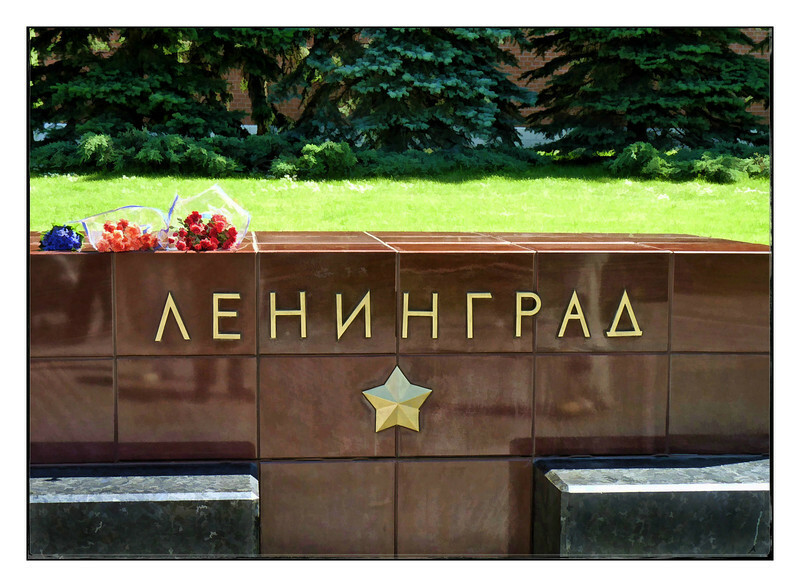 Many cities suffered horrific losses during the war, few as much as Leningrad (St. Petersburg). Hitler's siege & blockade of Leningrad lasted 900 days during which time rationing in the city decreased to 125 grams of a bread, consisting mostly of sawdust, a day. In January & February 1942, 200,000 civilians died from cold or starvation. The official loss in Leningrad is 632,000 though many estimates put it as high as 1.5 million. Nice colors here, and neat processing. This is so very very nice. 1.5 million lives is a horrible loss. It's a good omen that the sun is shining on this shot! Love it! I've read several books about the blockade - good to see a memorial. Thanks for sharing the history of this memorial, nice shot. Lpve the shot and the history. Like your PP choice also.